You basically have 2 accounts and need to delete the one tied to Apple ID so you can then pair it to your existing Day One account (with email and password). Please note: if you are signed out of Day One Sync on all devices, this will not affect your data stored on each device. Sign out by going to Day One app > Settings > tap your name at the top > Sign Out. On Mac, go to Day One > Preferences > Sync > Sign Out. 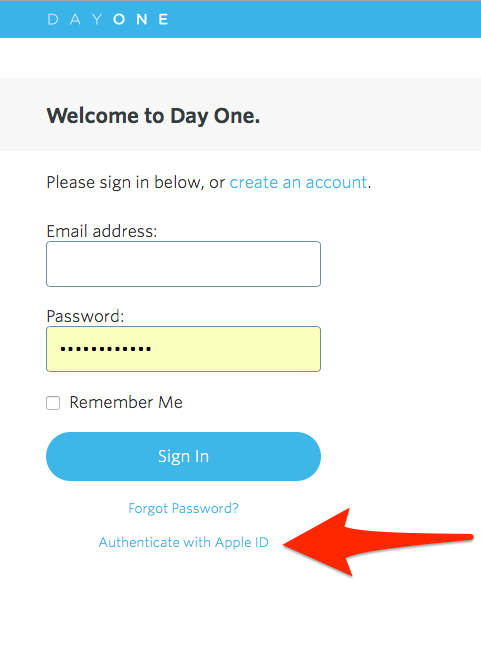 Go to dayone.me/user/login, then click Authenticate with Apple ID (see screen shot below). Click Account, then click Delete Account. To confirm this choice, click the Authenticate with Apple ID then sign in again. Click Delete My Day One Account. Go to dayone.me, and sign in using your original Day One account email address and password. Click Account, then click Link Apple ID. Sign in using your Apple ID email address and password. After completing the above steps, your Apple ID is now linked with your account.